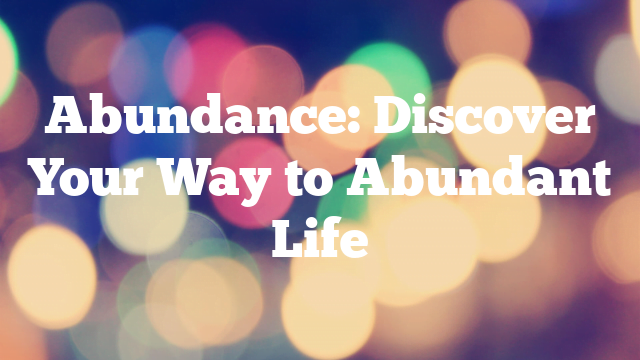 Abundant Life is the feeling that everything you need and want has already been delivered. It’s free to relax on the cushion of the Universe and letting all you need to flow into your life – be it cash, a beautiful place to live, a satisfying job, love – all your needs. Unfortunately, most of us have been conditioned by our parents’ previous experiences and views that we believe in a lack. We believe that we must fight for survival – and of course this struggle, this struggle is what creates our beliefs! If there is a feeling of lack in your aura, then you will attract a lack. If your thoughts are lacking – then you will create an environment in which this lack will be manifested, it will send you the Universe. It’s the same with health – if you focus on diseases – you’ll create more and more! You should focus on wealth and health. If you want to create ABUNDANCE, you should create a GENEROSITY in your thoughts, aura and surroundings. It can be quite a challenge – to change our thoughts in terms of prosperity, when we see so many “proofs” of something completely opposite – we all know how powerful and so limiting is the conscious mind! So learn how to outwit him! Create a sense of wealth around you and your conscious mind will start believing that wealth is real and then, by attracting it, it will create wealth for you. Surround yourself with everything that you associate with wealth. Go to places that you associate with wealth. Write down your desires in a place where you can see them. Affirmations must be formulated in present tense and in such a form as if you already had / had what you want, e.g. “I have lots of money now” etc. At this point it should be emphasized how important it is to create a feeling that we already have what we want, and that’s because similar attracts like. So the feeling that we HAVE a lot of money, the perfect partner, etc. will naturally attract this to us. However, when we WANT something, it will create MORE CHARMS of having what is highly unsatisfying! So you must use all the means to convince yourself that you already have what you want. And you will receive it. To create the perfect relationship, you must first feel, “I’m already in a perfect relationship.” Feel the excitement associated with it. Feel the deep gratitude. Feel the blessing. And before you know it, your dream will come true! You must not hesitate. If you notice that you give up and begin to think negatively, grab yourself / yourself and return to positive thinking. Keep positive intentions until the dream comes true. And then continue with gratitude. Try not to be in the company of negatively minded people. Do not let others impose your negative attitude on you. Our thoughts can be compared to the light illuminating a dark room. Different things can be in such a room, but we do not see them because it is hidden by darkness. It is only when they are lit that we can see them. The same is with our thoughts – when we think about something, it is as if we were driving a beam of light into a specific part of the room – then we see this part clearly and clearly. The rest of the “room” is invisible at the time, because we do not focus our attention on it (not “illuminate” it). From a practical point of view, things in a room only exist when we look at them (when the “light” of our attention falls on them). Because when they hide the darkness, we can not say with certainty whether they exist or not – we do not see it. Out of all thoughts in your mind at the moment, there is only real, which at this moment you give attention to which you are wondering. All others are only potential ones, i.e. you can think about them in a moment, but it does not necessarily have to be that way. If the world is a room filled with things, and your thoughts are light that allows you to view individual parts, then if you “look” you will be filled with poverty, poverty, inability, lack – you will never “see” wealth, opportunities, abundance, because they lie in another part of the room! Based on your thoughts, you interpret the world you see. So at the same time, it can be seen as a place full of poverty, where there is no chance to achieve success, as well as a place filled with abundance of possibilities, implementation and success. It all depends only on the way you look at the world. From where you place the headlamp into thoughts. SECRET: your thoughts are the main tool for achieving wealth. Even the greatest fortunes were at first only an idea / vision. Of course, you must learn to use even the best tool. Inhaling through the nose of the air, imagine that through the top of your head you are influenced by golden energy, golden light that flows to all your cells of the body, and when you exhale, leave your mind and body with all worries, sorrows, and shortages. Do not rush. Do it calmly focusing on your breathing and body. Feel how the golden energy penetrates into every cell of your mind and body as it dissolves all tensions. See yourself, how you fill yourself with the golden light, how the golden light begins to emanate outside of your physical body, how it moves further, further, further … And now say aloud or affirm the following affirmation: I AM the Pure Mind of God. Repeat it several times. Let there be a clean channel of your connection to the Source. You feel showered with tremendous abundance. You see them everywhere. It surrounds you everywhere. You open your eyes and see them everywhere. Your feet tread on rustling money. You hear this pleasant and joyful rustle of money. Your legs are immersed in this richness, in this immeasurable abundance. You feel filled with wealth. You are God’s Abundance. You are the God’s wealth in your hands and at your disposal. Now and always. Enjoy and rejoice. Thank you, thank you for this wealth. Now share this wealth with others. Send them to your beloved loved ones. Send to people who “bother” you in life. Send where you feel you need them very much. Enjoy this giving. Feast this moment, this joy. Look at the golden leaves – the money is still flying to you, to your hands. There is an infinite number. They are flying to you from various sources, from different sides. Look around, they are behind you, they are in front of you, they are next to you. It’s all for you. Give yourself this wealth. Take them. Enjoy, rejoice, laugh, dance, cheer for joy. Let the whole world know that you are rich, that you accept this wealth and that you are so enormously and grateful for it. Fill with these beautiful feelings and emotions. And when you feel that you are already filled enough with abundance, return to the physical space to Here and Now. Remember all the feelings and emotions you have experienced. Write them down with details by automatically writing without paying attention to style and mistakes. Put this card to your heart. Pour a lot of love into it and come back to it whenever you feel when you want to experience the feeling of abundance.